Movement Activities for a Perceptual Motor Program for 4 to 5 year olds.The program aims to provide a sequential, developmental set of movement activities which will lead naturally into the Perceptual Motor Programs used in schools. A movement program consisting of 150 plus sequential developmental movement activities designed to develop locomotion, balance, eye hand skills and fitness levels. Activities also develop body image, laterality and an awareness of time and space. These skills will assist children in readiness for the formal learning process at school. The program leads naturally into the school perceptual motor program. Sixteen sets of activities to be completed over a year. 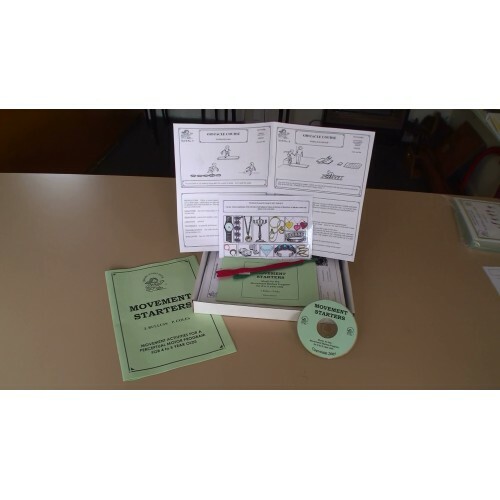 The program provides a list of resources required, detailed instructions for each activity, sketches of activity setup, evaluation questions, laminated pictures, wristbands, and a CD of songs and music.